Trader Alert: For the first time ever, Oilprice.com is making its annual Top 50 Oil & Gas Companies report available to members. Sign up to Global Energy Alert today and find out who topped this year's rankings. - Exports to China declined, while exports to South Korea, Canada and Taiwan increased. 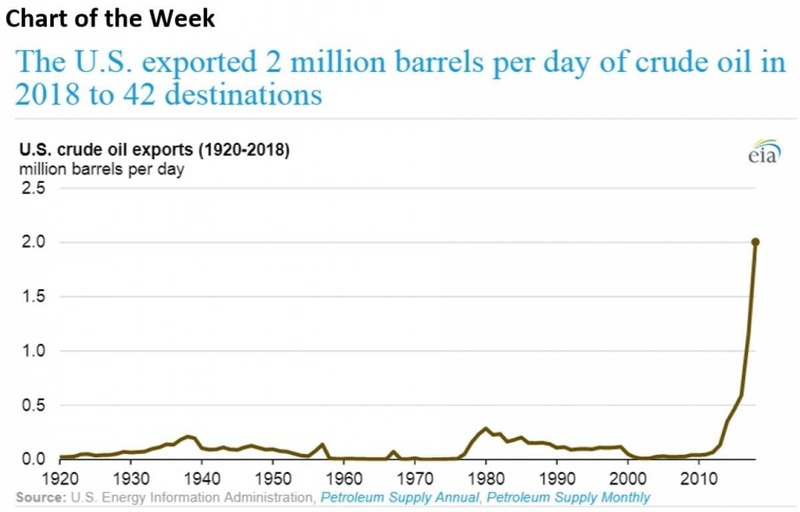 - In 2018 the U.S exported 2 mb/d of oil, up from 1.2 mb/d in 2017, according to the EIA. - The mismatch between the medium and heavy oil oriented refining infrastructure on the Gulf Coast, and the increasing volumes of light oil from U.S. shale fields, has contributed to the surge in exports. • Concho Resources (NYSE: CXO) says it will establish a 50-50 joint venture with Frontier Midstream Solutions to build oil gathering, storage and transportation services in the Permian. • The EPIC Pipeline, backed by Ares Management (NYSE:ARES), including stakes by Noble Midstream Partners (NYSE:NBLX), Altus Midstream (NASDAQ:ALTM) and Diamondback Energy (NASDAQ:FANG), won approval for its initial rates for shippers from FERC. • Shale stocks soared on Friday after Chevron (NYSE: CVX) announced its $33 billion purchase of Anadarko Petroleum (NYSE: APC). Pioneer Natural Resources (NYSE: PXD, was up 11.3%), Concho Resources (NYSE: CXO +8.7%) and Noble Energy (NYSE: NBL +7.4%) all rose on the news. Oil prices dipped on Monday on renewed fears that OPEC+ might abandon production cuts, but prices firmed up in early trading on Tuesday. Chevron buys Anadarko for $33 billion, signaling shale consolidation. Chevron (NYSE: CVX) announced a decision to buy Anadarko Petroleum (NYSE: APC) for $33 billion, a move that could spark a wave of consolidation in the shale industry. Occidental Petroleum (NYSE: OXY) reportedly was scrambling to propose a merger with Anadarko before Chevron won out. 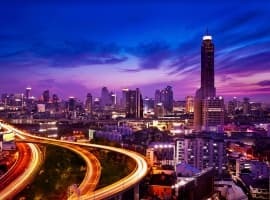 The acquisition could set off a round of M&A activity as bigger oil companies swallow up smaller ones, and the industry as a whole shifts towards large-scale development. Other E&Ps saw their share prices soar on the news on expectations that they will be bought out by larger rivals. Delek and Ineos looking at Chevron’s North Sea assets. Chevron is looking to dispose of non-core assets, particularly after its purchase of Anadarko, and that includes some projects in the North Sea. Delek Group (TLV: DLEKG) and Ineos are reportedly the “front-runners” to scoop up Chevron’s North Sea holdings. 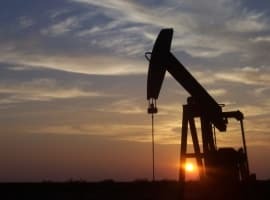 U.S. shale production to rise by 80,000 bpd in May. 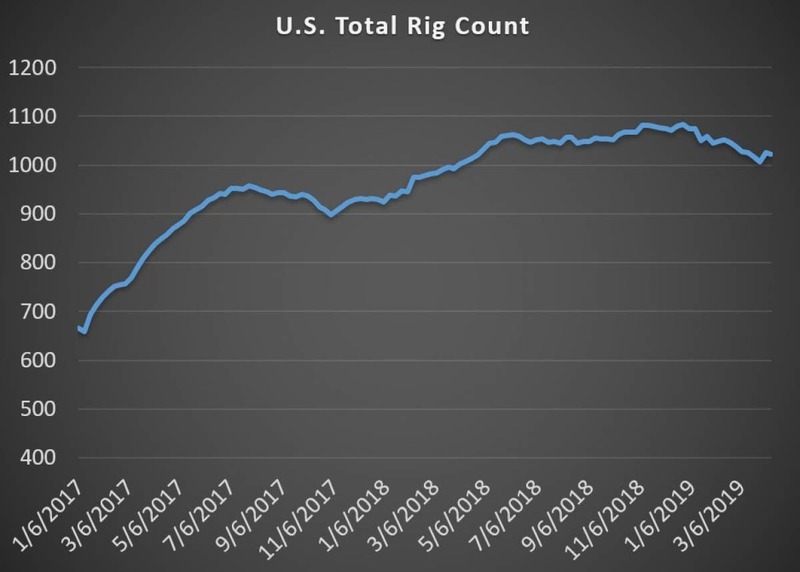 According to the EIA’s latest Drilling Productivity Report, U.S. shale output is expected to rise by 80,000 bpd next month, led by a 42,000-bpd gain in the Permian. Petrobras dragged down by Brazilian government’s pricing decision. The government of Brazilian President Jair Bolsonaro decided to cancel a price hike on diesel last week, over concern for the impact on truckers and consumers. After cultivating a pro-business reputation, the decision spooked investors and dragged down Petrobras, which will have to shoulder the burden of regulated prices. Petrobras’ share price fell 8 percent on the news, the largest decline in 10 months. Vermilion Energy to drill in Croatia. Canada’s Vermilion Energy (NYSE: VET) will drill two exploration wells in Croatia in June, according to Reuters. “Although we see evidence of gas charge from the new seismic data we have acquired, we’ll not know for sure whether any of this is commercially producible until after these initial wells are completed,” Bryan Sralla of Vermilion told Reuters. Flaring surging in New Mexico. Natural gas pipeline bottlenecks are contributing to a soaring rate of flaring in the Permian basin. The Environmental Defense Fund estimates that flaring rates are five times higher than what the industry has reported to the U.S. EPA. Volkswagen wants more gigafactories. Volkswagen wants joint venture partners, including SK Innovation, to build new battery gigafactories to ensure adequate battery supply for a rush of new electric vehicles. “Anything below that amount would make little sense,” VW CEO Herbert said on the sidelines of the Shanghai Auto Show on Sunday, referring to plants with the capacity to produce at least one gigawatt of batteries. Alta Mesa burned through $1 billion. A startup shale company targeting Oklahoma’s STACK play, backed by a $1 billion investment, is on the brink of financial ruin, according to a profile by the Wall Street Journal. Alta Mesa was a “special purpose acquisition company,” or SPAC, a strategy in which the company starts with no assets and issues shares to raise funds in order to make acquisitions. It’s supposed to be a rapid way of scaling up, but is riddled with risk. The tale is indicative of a broader experience by multiple shale companies in Oklahoma, buoyed by hype and interest from Big Finance, but ultimately producing disappointing results. The WSJ says that more than 60 percent of the energy companies acquired by SPACs since 2016 are now worth less than they were when they began trading publicly. Ineos warns it could abandon fracking in England. Ineos said it would abandon drilling in England unless regulators loosen drilling rules that guard against seismic activity, according to the FT. Rules on seismic activity have slowed drilling efforts by both Ineos and Caudrilla. P.S. – Oilprice.com is releasing its annual Top 50 Oil & Gas Companies report to readers. 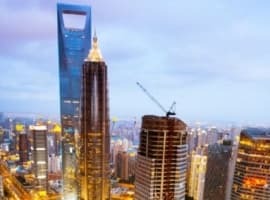 This 5-part series includes an in-depth financial and geopolitical analysis of each company, including their greatest strengths and biggest risks. This year, a limited number of our Global Energy Alert subscribers will get the chance to see which company topped the list!